As we all hunker down, or race to the shop for bread, milk and Kendal mint cake at the prospect of ‘Beast from the East’ blizzards, it’s easy for our thoughts to turn towards the prospect of a summer holiday and a bit of warmth on our backs. We’re therefore delighted to share an exciting project that we worked on towards the end of last year; a brand-new brochure store for Thomas Cook. Having developed the original brochure store for Thomas Cook several years ago, the time was right for a re-design. The objective was to bring the site up-to-date so that it reflected the many changes that have happened in the world of digital, with a particular focus on user experience. One of Thomas Cook’s key aims is to provide people searching for a holiday with the inspiration they need to explore new places, find their ideal holiday or to try a completely different type of holiday. In order to do this, we needed to create a website that was more than just an online collection of brochures. It had to be inspiring as well as functional. Improved interactions and enhanced user experience. As well as modernising the design of the brochure store, enhancing the user experience was a vital part of the project. With this in mind, our Head of UX, Ollie, carried out a workshop with the Thomas Cook team and also received feedback from the Customer Care team. Ollie also travelled over to Bulgaria to shadow the Thomas Cook Live Chat team, who use the brochure store on a daily basis when answering queries from customers and to direct them to particular destinations. This allowed Ollie to understand how customers used the old website and to discuss ideas for how it could be improved. With this level of understanding, along with user testing and a full UX review, we could make the new site as user-friendly as possible. Ollie assures us that it was all work and no play! The new site allows people to interact with it in new and improved ways. This includes the ability for customers to make their own virtual holiday scrapbooks by saving the destinations or resorts that they’re interested in, into an online scrapbook. By creating an account, people can save the scrapbook and return to it at a later date or pop into one of Thomas Cook’s stores to discuss the options with a travel consultant. The site also remembers the brochures that customers have looked at so that they can easily find them when they return to the site. This is important as the normal process for many people when booking a holiday is to carry out lots of research into various destinations/resorts, discuss it with a partner, friends or family, before making a final choice. The responsive design of the brochure store means that it works seamlessly on any mobile or tablet device, whether it’s a smartphone, tablet or laptop. After creating a series of prototypes and ensuring that the new design answered the questions that customers were asking and meeting the brief, the site was then developed, the functionality tested and additional user testing was carried out. 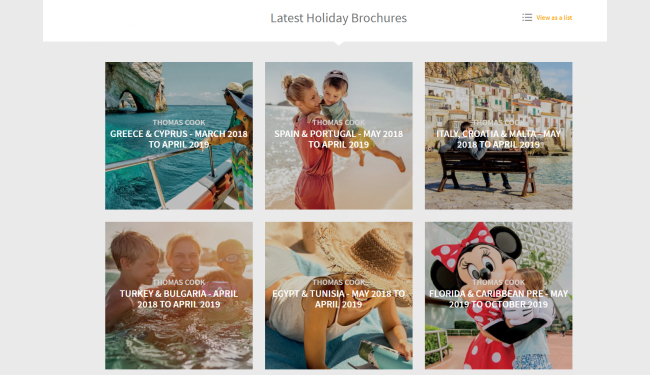 Now, after months of hard work, we’re ready to take full advantage of the new and improved brochure store by lusting after some of Thomas Cook’s dreamy resort holidays. And now that it’s live, you can do the same at www.brochure-store.co.uk. How will global technology trends at CES 2018 impact your business?